Fifa has asked the Russian Football Union (RFU) to explain an alleged incident of racism inflicted on former Arsenal midfielder Emmanuel Frimpong. Ghana's Frimpong was sent off playing for FC Ufa against Spartak Moscow on 17 July for a gesture to the crowd after saying he heard monkey chants. 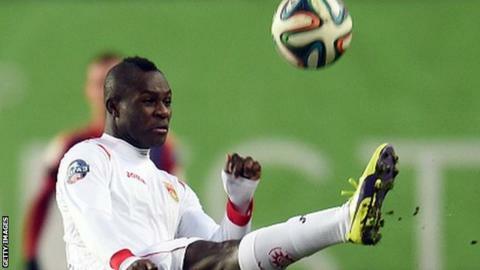 The midfielder was banned for two games but Spartak escaped punishment after the RFU found no evidence of racism. Fifa has given the RFU until Tuesday, 28 July to respond to its request. Russia host the 2018 World Cup and have been criticised for their handling of the issue of racism against a backdrop of incidents. In February, football anti-discrimination group Fare documented more than 200 incidents of racist and discriminatory behaviour linked to Russian football over two seasons. Fifa sustainability boss Federico Addiechi says the governing body will work with the RFU to tackle the problem ahead of the World Cup, with the qualifying draw for the tournament set to take place on Saturday in St Petersburg. He said: "It is up to us as the organizers of this event to make sure this event is welcoming everyone, not just for the players and participants but also for the fans. "If the Russian Football Union are in need of our support, and I think they are, then we can provide certain support." United Nations chief of anti-discrimination Yuri Boychenko says Russian authorities are slowly acknowledging racism is a problem in the country. He added: "First comes recognition, that authorities here should recognise that there is a problem and I believe that the recognition is coming." Russia's minister for sport Vitaly Mutko - a Fifa executive committee member - said the country's football authorities were working to address the problem. "We have introduced punitive sanctions for clubs and offenders and they are more harsh now," he said. "Another measure is a special inspector at the match whose responsibility will be to pay attention to that kind of incident so no incident is left unpunished." Read more on Could racism damage 2018 World Cup?